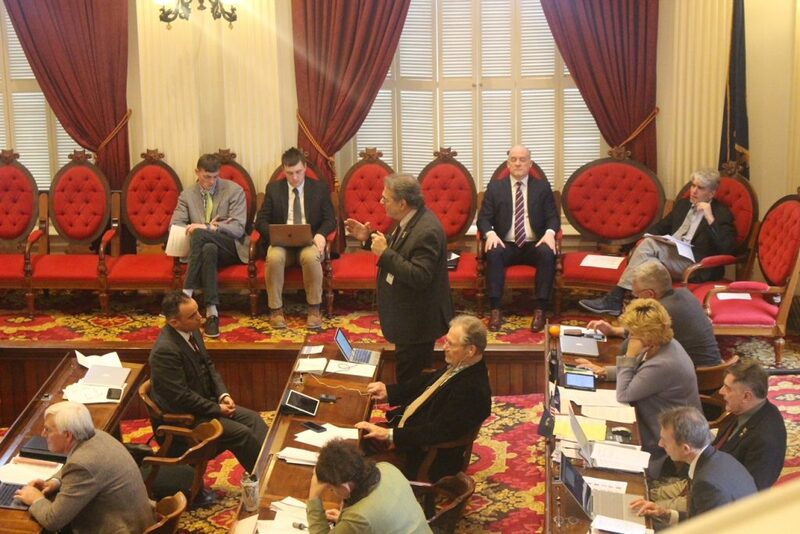 EXTEND IT: Act 46 opponent Rep. Joseph “Chip” Troiano, D-Stannard, asks his colleagues to consider a bill that will allow some schools more time to comply with Vermont’s 2015 school district merger law. MONTPELIER — After narrowly voting down the “Scheuermann Amendment” that would have given all schools facing mergers a one-year extension to comply with Act 46, House lawmakers on Thursday voted to allow some schools to get the extension. Rep. Peter Conlon, D-Cornwall, ranking member of the House Education Committee, told colleagues on the House floor about the compromise that earned approval by a vote of 134-10. “We approached this by looking at the districts that are still not in a merger, and we’ve attempted to sort of categorize them by similarities and the different conditions that each are under,” he said. The legislation postpones the consolidation mandate for about half of those districts that have not been able to merge with beneficial partners. The rest must meet the original deadline of July 1, 2019. The two main categories with most of the schools are A, with six districts, and B, with five districts. Category A means no extension — the schools must merge this year. Category B districts get until July 1, 2020. “No matter your opinion of how these districts got to where they are, the [original] deadline will be very difficult,” Conlon said. 23 Union School District, which will merge by 2019. A category E includes four more district, where the deadline will be determined by boards of the existing districts. All five categories, and associated districts, are outlined in the bill. Rep. Lawrence Cupoli, R-Rutland, one of the sponsors, said the committee listened to a lot of education professionals to get this amendment passed. Rep. Joseph Troiano, D-Stannard, said he originally voted against Act 46 and he supports this bill. Stannard is part of a four-community school merger in the Northeast Kingdom, which includes Greensboro, Hardwick and Woodbury. The state had previously told the school boards not to worry about merging. But last November the State Board of Education suddenly reversed course and called for a merger. The new combined district, Orleans Southwest Union Elementary School District, appears in the category B list, meaning these communities get an extra year to merge. Also on the B list was the Lamoille South Unified Union School District, which serves many of Scheuermann’s constituents. True North asked her if her constituents are happy with the outcome. “I think … [it’s a victory] that we had this debate, which wasn’t really a priority at all for the leadership and the education committee. They wanted to not have this,” Scheuermann said.